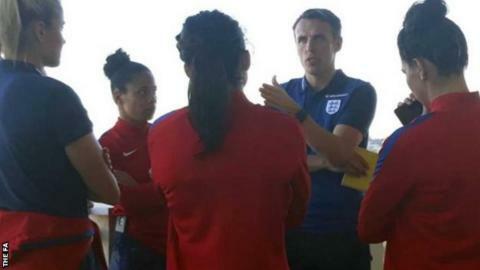 Phil Neville has been appointed head coach of the England women's team on a deal until 2021. Neville, 41, has coached at former club Manchester United, Valencia and England Under-21s but has only managed one game - at Salford City, a team he co-owns. The ex-England full-back takes over from Mo Marley, who had been in interim charge since Mark Sampson's sacking. "This squad's on the verge of something special and I believe I can lead them to the next level," said Neville. High profile but minimal managerial experience - will Neville be a success? Neville's contract runs through to the end of the 2021 Uefa Women's European Championship campaign. But he will first lead the Lionesses - ranked third in the world - at the 2019 World Cup in France, where they will be among the favourites. "I am honoured to be given the chance to lead England," he added. "With the new coaching team we are putting in place, we can help the players build on their great progress in recent years. "There is no greater honour than representing your country and it will be a privilege to do it again." The Football Association's director of women's football, Baroness Sue Campbell, said: "I am really pleased we have got Phil and we will build a brilliant team around him that covers every base. "His enthusiasm, passion and desire for the role impressed us all and once he emerged as a candidate we knew we had the right person for this talented squad." Neville added that he was "passionate about working within the wider set-up at St George's Park, with influential people such as Mo Marley and Casey Stoney, and with the support of Baroness Sue Campbell and the wider women's game". Neville's appointment gained a mixed reaction, and after saying on Twitter how "proud and honoured" he was to take on the role, he quickly added "see you all soon" after past tweets came to light. In posts dated from 2012, he said: "Morning men, couple of hours cricket before work sets me up nicely for the day." When people responded asking whether he would address women, he clarified in another post: "When I said morning men I thought the women would of been busy preparing breakfast/getting kids ready/making beds-sorry morning women!" Other users picked up on comments Neville had made when interacting with his sister and with his wife - and one in which he joked he had "just battered the wife". After those posts gained thousands of retweets, Neville then deleted his account, which had 1.6m followers. The former Manchester United and Everton midfielder played 59 times for England and has won 10 major trophies, including six Premier League titles. But his first taste of women's football will involve taking on the top two teams in the world - United States and Germany - plus France, in the She Believes Cup, starting on 1 March. Predecessor Sampson was sacked from his position following evidence of "inappropriate and unacceptable behaviour" in a previous role. During Sampson's tenure, England reached the Euro 2017 semi-finals, losing to eventual winners the Netherlands, having come third at the 2015 World Cup - their best finish at the tournament. Neville, who has a Uefa Pro Licence and lives in Valencia, was an assistant to England Under-21 boss Stuart Pearce in their disappointing 2013 European Championship campaign. He joined David Moyes at Old Trafford, where he lasted the 2013-14 season, despite the Scot being sacked. His next top-level coaching job was at Valencia, where he was appointed coach in July 2015 and left soon after brother Gary was dismissed as manager following a run of three wins in 16 league games. His experience and knowledge of the women's game is understood to be limited, and opinion is mixed about whether he is the right person for the job. England and Chelsea midfielder Katie Chapman said: "Surely there must be coaches out there who've had a lot more experience in the women's game, and of actually being a manager?" But former England goalkeeper Rachel Brown-Finnis said: "I think he is a great fit for England and he would inspire me. "This is someone who has worked under Sir Alex Ferguson and is from a group of players who have lived with a winning mentality their whole careers. "That is something which this team has never had, and needs to take it to the next level: a leader who knows what that looks like." Who were the other candidates? The FA was keen for a female coach to replace Sampson but was forced to look elsewhere after early potential appointments dropped out of the running. Chelsea boss Emma Hayes - who led her side to the WSL Spring Series title in 2017 - pledged her future to the club, and former Arsenal head coach Laura Harvey took up a new role with the Utah Royals in the US. Englishman John Herdman was also a contender prior to being named head coach of Canada's national men's team after more than six years in charge of the country's women's team, and Manchester City boss Nick Cushing was interviewed but signed a new contract with his club. Marley also applied for the role having spoken of her desire to give the England players "stability", but later withdrew from consideration. Marley will now return to leading England women's development teams, including taking a squad to this summer's U20 World Cup. During her time in charge, Marley led England to victories in World Cup qualifiers against Bosnia & Herzegovina and Kazakhstan - in which they scored nine goals and conceded none - as well as a friendly defeat by France.